Join Sierra Adventures and enjoy a backcountry snow expedition to the finest untracked powder snow in the High Sierra. Intro: Call your friends and book this unique high altitude snow sport adventure in the Lake Tahoe area. 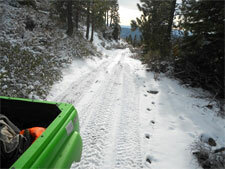 Enjoy scenic views and explore the snow-covered trails of the Sierra Nevada. This is heliskiing without the high costs. Book this early; spots are limited. The Tour: Your snow adventure begins with a complimentary shuttle pickup at any local hotel. In the snowcat you'll have picturesque views of the beautiful Sierra and Lake Tahoe, the opportunity to explore scenic trails, and possibly catch a glimpse of some wildlife. Suggested Clothing and Gear: Sub-Zero Winter Gear-No Cotton! / Wool Hat / Gloves / Shell Parka / Goggles / Gaiters / Water Proof Boots / Thermax-Gortex Underwear / Dry Towel / Change of Clothes / Two-way Radios / Powder Gear.